General observation suggests that the issue of what happens after death is one that the average person (at least those who predominantly operate in what might be called ordinary society) either does not explore, or perhaps is reluctant (if not outright afraid) to face. It may be that the adoption of such a position is a natural and unavoidable outcome of how the world-at-large views the issue of Life, Death and any question or consideration of what happens after death - either to an individual, or to all that may be said to live. More often than not, opinions and viewpoints regarding what happens after death have been shaped and established by the religious, philosophical and even scientific explanations and expositions which are predominantly present in society at the present day. And what might be considered a factor which further compounds the issue is that, for the most part, those explanations and expositions are accepted without any question or objective consideration as to whether what is imparted regarding what happens after death makes any sense. To borrow words recorded by and attributed to Wallace Wattles (widely recognized as the author of "The Science Of Getting Rich" and some other books): "Every fact we learn leads to the discovery of another fact; knowledge is continually increasing." On that basis, as Man's intelligence expanded from his crude beginnings up to where the human race is now, it should not come as a surprise that certain minds were directed towards serious consideration of what happens after death. This is not to say or infer that science (in this instance, physical science) has not made investigations of their own with regard to figuring out what happens after death, and, if it seems appropriate, one or more examples of investigations from the standpoint of physical science will be mentioned here. However, and in keeping with the overall aim of this web site and its content, the aim here is to reveal, in a concise manner, a viewpoint generally offered by philosophy and metaphysics, regarding what happens after death. Also, rather than give any full and detailed explanations, what this Author considers some (if not all) of the more pertinent points on the subject will be presented here, and the visitor who desires to explore further the issue of what happens after death, as presented in this discourse, will be directed to one or more sources of reference at the end of this discussion. One final advisory shall be presented here before commencing - specifically, much (if not all) of what is stated here is founded upon at least an appreciation (if not a full understanding) of virtually everything that has been presented in previous pages, in general accordance with the recommendations stated on the Home Page as to how the visitor should progress through the content of this site. It is not automatically presumed to discern or assume what any particular visitor might themselves adhere to, regarding the information contained in this web site, but, with specific reference to a visitor who may be considering the subject of what happens after death for the first time, without that appreciation of what has gone before, it is debatable as to whether anything stated beyond this point will make any sense. Accordingly, it can only be suggested that, if the visitor has not taken the time and made the effort to go through the previous content, it might be in their best interests to do so first, before proceeding further. A single and exact definition of the phenomenon known as Death may be difficult to establish, as, with particular reference to its occurrence in human beings, Death has always been obscured by mystery and superstition, and its precise definition remains controversial, differing according to culture and legal systems. However, most general definitions of the phenomenon usually classify Death as: the total cessation of all of the life processes (inclusive of, but not necessarily limited to: heartbeat, respiration, brain activity, cellular activity, assimilation of foods, elimination of wastes, and bodily motion) that eventually occurs in all living organisms. Going further, one can even include the inevitable disintegration of the physical body associated with the organism. This is perhaps why so-called inanimate material, such as rocks, soil, metals, and man-made substances (e.g., plastics) are often defined as never being "alive" to begin with, since there is no evidence to date that these materials display or manifest any of the processes previously described. 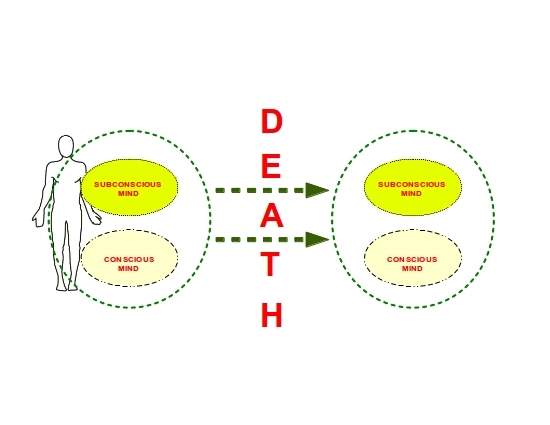 Here is where the issue of perspective or viewpoint makes a significant difference towards consideration of the issue of Death, as well as towards any consideration of what happens after death. Most (if not all) of what has been stated in the previous paragraph may be said to be connected to a perspective or viewpoint which is rooted in the physical or objective side of things, and, adjudged solely from this viewpoint, it indeed makes sense. But more often than not, said viewpoint is often taken as the only one that exists, and gives virtually no consideration to that non-physical side of things, which, being the complimentary or polar opposite of the physical side, is actually just as real, just as substantial, and just as tangible. And it is only from an understanding, or at least an appreciation, of what can be gained from consideration of that non-physical or subjective side of things, that a newer and different concept of what happens after death can be revealed - and, if carefully considered, it will reveal itself to be one that can be believed in, because it makes sense. 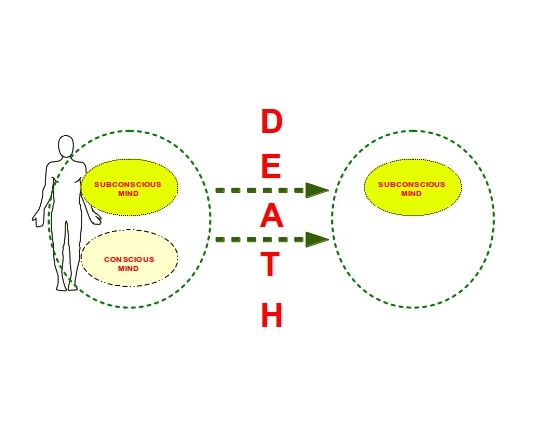 This newer and different concept regarding what happens after death can be considered as having its root or origin in understanding the nature of that Original Creative Power (Spirit), as defined and described in previous discussions (for example, that on Universal Mind, which, as stated elsewhere, is another descriptive term for Spirit). To briefly recap, careful consideration led to the logical and sensible conclusion that Spirit, being the Principle (Source) of Life, is both Infinite and Eternal, i.e., it has always existed, and will always exist; irrespective of any particular form which may be said to exist in the physical or objective universe (refer to the discussion on Outward Manifestation). It was also deduced in similar manner that (to borrow the phrase from a certain movie considered a cult classic by some) "there can be only one" tendency or inherent motive in Spirit - namely, the increase, expansion and fuller expression of Life, and that any other tendency would be self-destructive. In addition, and in light of accepting the generic tendency of Spirit towards "Life and more Life", it has also been deduced that the true purpose of Evolution is to carry onward, forward and upward that increase, expansion and fuller expression of Life, to those degrees that have not yet been manifested or demonstrated, but are as-yet un-expressed possibilities. And finally (for now), it has been put forth (and mentioned in the discussion on Spiritual Science, that Man, being the highest form of manifestation of Spirit (or, as described elsewhere, an individualization of Spirit) is also equipped with the capacity and ability to choose how he will exercise his inherent creative instrument of Thought. This last point is important, for the simple reason that, as a result of the working of the Law of Cause and Effect, from which no-one and nothing is exempted, the choice made by Man, whether individually or collectively, regarding the exercise of the Creative Power of Thought, inevitably leads to the realization of a corresponding Effect in the objective universe. Now, we shall pause to recall what was highlighted in one or more previous discussions - namely, the inner nature of Man, which itself is of significance, and should be understood, in order to much (if not all) of what metaphysics on the whole might impart, regarding what happens after death. 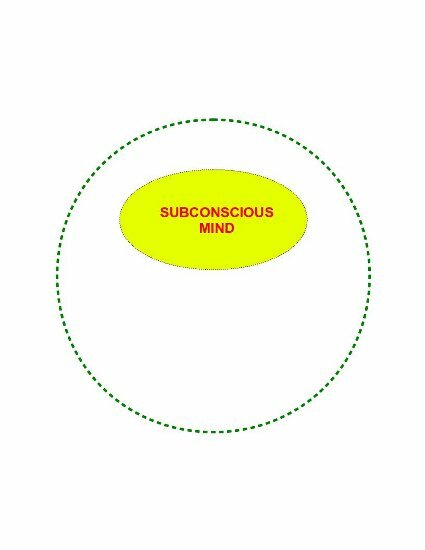 From the discussion on The Subconscious Mind, it was postulated that Man is essentially a spiritual and mental entity - expressed another way, a miniature reproduction of the Universal (Subjective or Subconscious) Mind as an Individual Subjective Mind, and also possessing an Objective or Conscious Mind, which, as one of its functions, constitute the means by and through which Man receives impressions and sensations from his objective or physical environment, through the physical senses. Many if not all of those great thinkers whose investigations established what is generally known about the working of the Mind seemed to reach the common conclusion that, with particular reference to the human species, Man's physical body is the instrument of the Mind, i.e., the vehicle by and through which the Mind interacts and corresponds with the objective or physical universe. A little consideration of that point led to the further postulation that the specific part of Man's mentality that interacts and corresponds with the physical world is his Conscious or Objective Mind, and that, from all observations, the primary part of the body where this interaction and correspondence takes place is the Brain. Hence, if there is no Brain, there appears to be no instrument in or through which the Objective Mind can work. Under such conditions, it has been postulated that the Objective Mind, without a Brain in and through which to operate, becomes quiescent or inactive; for all practical purposes, it ceases to exist, leaving behind the Subjective or Subconscious Mind. The above diagram may serve to lead to the establishment of at least one broad philosophical description of what happens after death - namely, the individual transits into a state of purely subjective or subconscious existence. 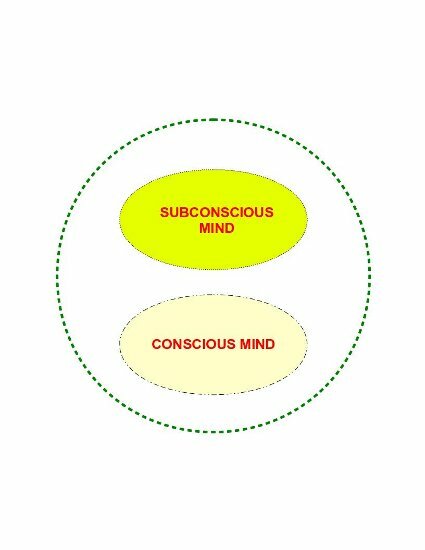 Now, a polite reminder is inserted here, from what was presented in the discussion on The Subconscious Mind, that, except for certain observations made during experiments in hypnosis, all that is known or accepted as making sense regarding the human mind has been concluded through philosophical reasoning. Out of said reasoning, because the Individual Subjective Mind is an individualization of the Universal (Subjective) Mind (or Spirit) - the latter subsisting independently of Time and Space, then it is reasonable to conclude that the same applies to the Individual Subjective Mind. There is no evidence to date that suggests that the Subjective Mind becomes quiescent if or when a human being undergoes Death, so that the only postulation that makes sense is that, even if the physical body should cease to exist, the Individual Subjective Mind should continue to be. Going further, it was also put forth on one or more previous occasions that Thinking is a perpetual activity; i.e., it is forever in operation, and not even the loss of the physical body can "turn it OFF". On that basis, it is also reasonable and sensible to accept as a fact that the Subjective Mind is working out some idea to a logical consequence, even if or when the individual exists in the purely subjective state. And since the Conscious or Objective Mind is, for all practical purposes, gone, then, with only a few exceptions (which shall be revealed in one or more of the reference sources to be found at the end of this discourse), the only thing that the Subjective Mind can work with is the Memories or the various thoughts and ideas which have been accumulated and stored therein, during the individual's objective life. More specifically, it is the thoughts and ideas that may be said to be the most dominant, i.e., that to which the individual gave the most attention during objective life, that will likely be worked on while in the subjective state. Without elaborating all the particulars at this moment, each and every person (Author included), if they were ever to undertake an exercise of thorough and honest introspection and self-analysis, would discover and identify their dominant beliefs - whatever they may be. Referring back to the previous revelation, if all that the Individual Subjective Mind has to work with is the dominant beliefs that were established during the individual's objective or physical life, it can be put forth that the purely subjective state that may be associated with the "passing away" of the physical body, means that the individual is, so-to-say, living and re-experiencing their memories - or to be more in line with what has been previously mentioned, their dominant beliefs (i.e., that to which they gave the most attention). It may be emphasized that a person's experiencing of their dominant beliefs is a purely mental process, since it consists of the Subjective Mind working with the belief, in accordance with the Law of Suggestion, and for which, a physical body is not necessarily required to support the experience. What the particular subjective state of any individual who has "died" might be can probably only be speculated, rather than accurately predicted, but, even without considering the issue of what happens after death, any and every person who undertakes the exercise of introspection and self-analysis previously mentioned may inevitably come face-to-face with some (if not all) stored memories that, on consideration, they would have no objection to "re-experience", and perhaps just as easily, others that they would prefer never again to face or deal with. And in conjunction with the preceding, there may one day come a moment when an individual who is still "alive", i.e., experiencing objective or physical life, may one day examine their currently established ideas, opinions and beliefs regarding just what happens if and when they "die", as well as what happens after death. As stated previously, the various ideas, opinions and beliefs to be found are various, and, more often than not, are shaped by what has been accepted by the individual - whether consciously or unconsciously - during their objective life. And as also previously stated, it can be propositioned that the majority of people do not in any way objectively examine what is presented to them regarding the subject of what happens after death, but instead they accept it unquestionably. From that point of view, it can be propositioned that the masses will, so-to-say, come face-to-face with their dominant beliefs - be they "good" or "bad" - after death, where, by virtue of the established fact that the Subjective Mind only operates by deductive reasoning, they are unable to choose a particular experience with which to operate. So far, one likely progression has been outlined regarding what happens after death - namely, the human's state of existence becomes purely subjective, where he or she only operates with his or her dominant beliefs. But the same reasoning which formulated this progression does not put this as the only option available or likely to transpire. The same reasoning, coupled with the appreciation of the Law of Suggestion also puts forward at least one other option, regarding what happens after death - to summarize, if a person habitually dwells upon what might be classified as good, beautiful and happy ideas (one might refer to the recommendation credited to St. Paul in the Bible - specifically, Philippians, chapter 4, verse 8), then by virtue of the operation of the same Law of Suggestion, these will become the dominant beliefs that the person will operate with if or when they transit into the purely subjective state. And there is even another possible option available. Via the same Law of Suggestion, a person is free to establish the belief that their Objective or Conscious Mind will, so-to-say, come along with them, even when they die, so that the person's complete mentality - both Subjective and Objective - is maintained even after death, and consequently, they are able to exercise all of their mental powers and faculties, just as they can while operating in and through their physical body. And furthermore, building upon that which was previously stated with regard to considering what happens after death, and also depending upon the source or sources of reference which is or are drawn upon, there actually exists a particular proposition that, upon careful examination, can be shown to be logical, reasonable and sensible - one which effectively states that the phenomenon known as Death is actually a condition that has been established as a natural and unavoidable result of a particular mode of thinking or belief. Put another way, the cause of Death can ultimately be revealed to be nothing less than a belief in Death, and consequently, if an opposite belief is established, Death can actually be negated, or even eliminated. Naturally, this proposition is not generally accepted knowledge at this time in human history, and, if a person who is generally un-accquainted with much (if not all) that has been presented in this discourse, as well as previous ones found on this website, is presented with this proposition, in the overwhelming majority of instances, such a proposition would be rejected as outright nonsense (or, if they choose, the person rejecting it might offer a stronger expletive to emphasize the rejection). Referring briefly to his personal experience for a moment, this Author will readily admit that, were it not for the appreciation and overall understanding of what has been presented previously, he too would automatically and outright reject such a proposition. And it should be emphasized that, except in a very small minority of instances, an appreciation and overall understanding of a proposition that Death can be negated or eliminated will, in all likelihood, not be easily established, for it involves the establishment of a new mode of thinking or belief, that is, for all practical purposes in total and complete opposition to the race-belief (i.e., the belief commonly accepted by the mass of mankind) that Death is the law of nature, from which none are exempted, or the belief generally rooted in a particular interpretation of theology or religion that defines Death as "the will of GOD". 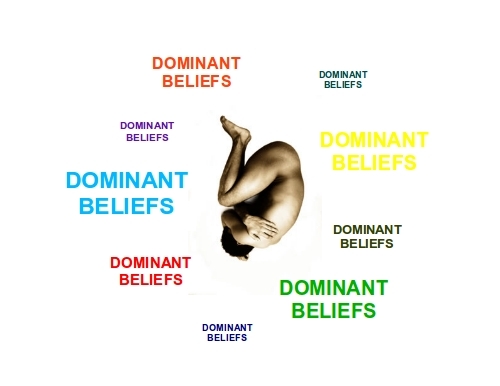 The process of changing established beliefs will, in all likelihood, be a process that must first be undertaken by each and every individual, and, only in this way, will the process eventually spread to the totality of the human race. Not surprisingly, in the course of carrying out that further progression, consideration of what happens after death is a subject which shall be included in that endeavour. In this Author's experience to date, possibly the definitive explanation which, if and when investigated and grasped, makes for a sure and solid foundation for taking on a newer and different insight regarding what happens after death, and the possibility of negating or eliminating Death altogether, is to be found in this chapter from "The Creative Process In the Individual" by Thomas Troward (published 1913). An external web link to an online publication of this chapter is to be found hereunder; clicking the link will open a new browser window. "Chapter 8 - The Denouement of The Creative Process (including consideration of what happens after Death)"
Perhaps more here than anywhere else, it should be emphasized that, depending on the visitor's acquaintance with information or explanations regarding what happens after death, such as is presented by this discourse, it should not be expected that the full content of the explanation will be grasped in one reading. In all fairness and without prejudice, it must be carefully examined and assimilated so that the underlying message may be apprehended.